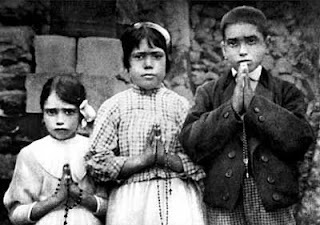 There are two points to the Fatima story that especially stand out to me. The first is that the children ask about the soul of their friend Amelia and our Lady told them that Amelia would be in purgatory until the end of time. What could a young person at that time have done that was so terrible as to merit that punishment? I don't know, but I think it is a sobering idea that I need to keep in mind for my own life and to warn my family about. One of the things seldom talked about in the Message took place during her first visit with the children in May of 1917. It concerns Purgatory. On that occasion Lucy began to question the beautiful Lady to find out who she was. Happy when the Lady said she had come from Heaven, Lucy immediately asked about her own eternal happiness and Our Lady lovingly told her that she would go to Heaven, After being assured that her two companions, Jacinta and Francis, would go to Heaven as well, Lucy further asked about two of her little companions who had recently died: "Is little Maria das Neves in Heaven," "Yes" answered Our Lady, "she is in Heaven." Finally, Lucy asked about another companion, called Amelia, and Our Lady answered: "She will be in Purgatory until the end of the world." Little Amelia was eighteen years old when she died. She is in Purgatory and will, on the testimony of Our Blessed Mother, stay there until the end of time. Her fate contains a warning for all of us. Let us take to heart and make certain that her fate will not be our own. Secondly, Mary showed the children a vision of hell, one that Sr. Lucia never forgot. As Our Lady spoke these last words, She opened Her hands once more, as She had done during the two previous months. The rays of light seemed to penetrate the earth, and we saw as it were an ocean of fire. The demons could be distinguished (from the souls of the damned) by their terrifying and repellent likeness to frightful and unknown animals, all black and transparent. This vision lasted only a moment, thanks to our good Heavenly Mother who, at the first apparition, had promised to take us to Heaven. Without this promise, I think we would have died of fright. O my Jesus, forgive us our sins, save us from the fires of Hell. Lead all souls to heaven, especially those in most need of thy mercy. Wonderful links about the feast and creative ways to celebrate it are in my deli.ci.ous file!